These treats are sweet and straightforward. We live in a time where many popular desserts and pastries are dominated by excess and over-the-top kookiness. Milkshakes are topped with 10 pounds of candy, doughnuts, cake balls, and sprinkles. Cakes are dressed up as unicorns. Doughnuts are glazed and given mermaid tails. People are drinking bubble tea out of light bulbs. It all gets to be a little much, doesn’t it? Perhaps it’s time we slow down a bit and enjoy some of the simpler, classic delicacies that have been delighting people for centuries. Clyde Greenhouse understands the importance of a good cookie. In 2001, he began selling his popular treats online, with a focus on corporate gifts. As business grew, he began to see a full-time future in baking. So he left his corporate job of 14 years and eventually settled into a brick-and-mortar location on North Beckley. Armed with a mission to “spread happiness through cookies,” the Kessler Baking Studio was born. The cookie shop is not large, it’s not flashy. But it’s clean and simply decorated. Walking in, you’re immediately drawn to a large countertop supporting a few dozen glass jars filled with cookies, brownies, blondies, and bars of all variety. There are no unicorns, no treats resembling Hello Kitty, and no cookies are served in a flower pot. They’re just cookies. But that doesn’t mean there’s not a lot to love here. Kessler Baking Studio is not short on options. 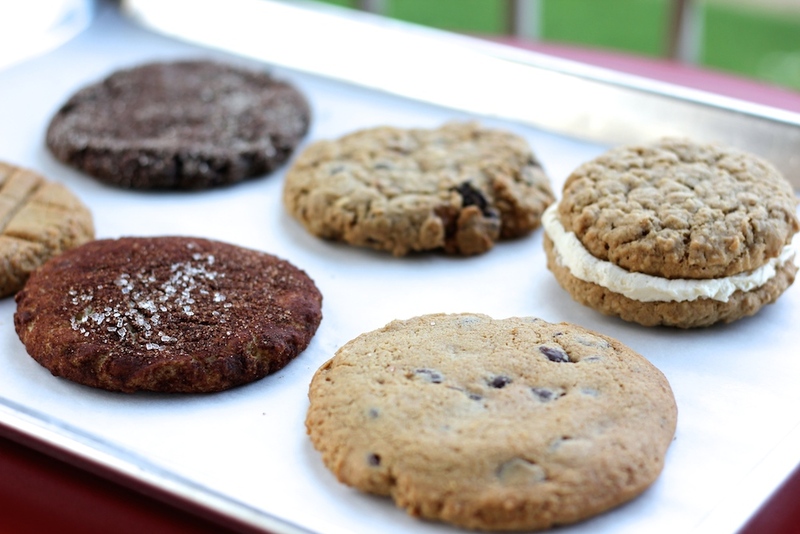 They’ve crafted a broad array of cookies and bars, enough to keep any avid cookie lover coming back regularly. Yes, you’ll find the standard chocolate chip, oatmeal raisin, peanut butter, and vanilla sugar cookies. But there’s a host of unique flavors that make this the an intriguing bakery. The spiced chocolate molasses cookie needs your attention. It’s a dark, rich chocolate cookie with sugar that’s been gently kissed by habanero pepper. The ginger honey is another lovely combination of sweet and spicy notes baked into a soft, sweet cookie. A few other notable considerations might be the pink lemonade sandwich cookie, the double-chocolate espresso cookie, the oatmeal toffee brownie, and the nostalgic jumbo oatmeal cream pie. This is, however, only a small sampling of the cookie options one is faced with at Kessler Baking Studio. On a recent visit, I snagged a half dozen cookies, intending to eat them at home in bed, with a glass of cold milk whilst plugging though my Netflix watchlist. However, those cookies didn’t even last the car ride home. I enjoyed them, to say the least. Clyde and his staff will take the time to guide you through each cookie option as you peruse the jars. It’s unlikely that you’ll leave the shop without something interesting in your bag. Pay Clyde Greenhouse a visit. Eat some treats. The shop has a cozy patio with tables and chairs should you choose to enjoy your cookies there. Kessler Baking Studio isn’t hopping onto the newest trend flying by your Instagram feed. It’s honest and dedicated to making great cookies, and that alone deserves your attention.